From Next restaurant’s chef Grant Achatz, chef David Beran, and Nick Kokonas comes Paris: 1906. A complete, uncompromising guide to reproducing the 4-star opening menu of the most talked about restaurant in the country. 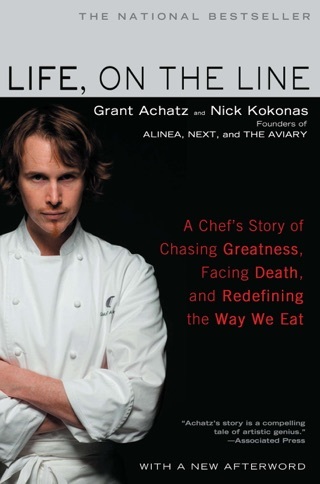 Chef Grant Achatz has been named Outstanding Chef in the United States by the James Beard Foundation and listed by Time Magazine as one of the 100 Most Influential People in the World in 2011. Grant and Nick opened Alinea restaurant in 2005. Alinea has been recognized as the Best Restaurant in the United States by both Gourmet Magazine and The San Pellegrino 50 Best Restaurants in the World awards, and was awarded the highest rating of 3 stars by the Michelin Guide, among many other honors. This is the first in our series -- exclusive to the iBookstore -- for each menu we produce at Next. Photography was shot in real time by our culinary liaison and research chef Christian Seel. Every dish and every preparation was shot as it was being created and served. Paris: 1906 includes the exact recipes for every dish served as documented by our chefs, over 200 photos, and short essays describing the key dishes and concepts. 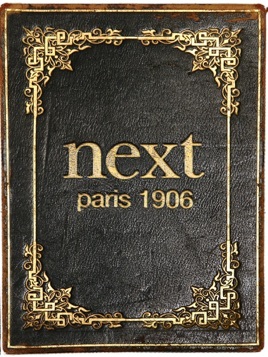 Whether you were one of the "lucky" ones to dine at Next Restaurant during this revolutionary inaugural menu or if you are a fan of Grant Achatz & Nick Kokonas's Alinea, this is a stunning online read of the Next Paris 1906 menu. The 127 pages leaves no details out in terms of the main dining room and the Kitchen table presentations including the non alcoholic and wine pairings. This eBook is an awesome reminder of this ground paving restaurant's approach to dining. Order a copy today and you will not be disappointed. A great work of classic recipes. Photography is beautiful. Anyone in the industry will appreciate all of the work that went into making the menu, however, it keeps the reader wishing there was a bit more substance, narration, and documentation of the actual event of executing the menu. I missed the first several menus at Next. This and the Thai ecookbooks are available, and makes you appreciate the work that went into the production of every meal. I am now a season ticket-holder, and am looking forward to the upcoming cookbooks, now long overdue. While it is difficult to reproduce the recipes, it is not impossible. Reading the cookbooks, though, just makes one a better cook.